Ragic has a convenient way of giving temporary log-in rights for guests without them having to register an account on Ragic (to be added into your database account). This can be done by setting an Guest User e-mail validation attribute. To do this, set the field type as an E-mail field, and check the Email id checkbox below. When this attribute is set to a field in the form, the temporary user will need to put down their e-mail in this field. As the entry is saved, Ragic will automatically send an e-mail to this e-mail address. This e-mail will contain a link that can authenticate that the guest user is the owner of this e-mail, which they can use to log in to Ragic and access that entry. 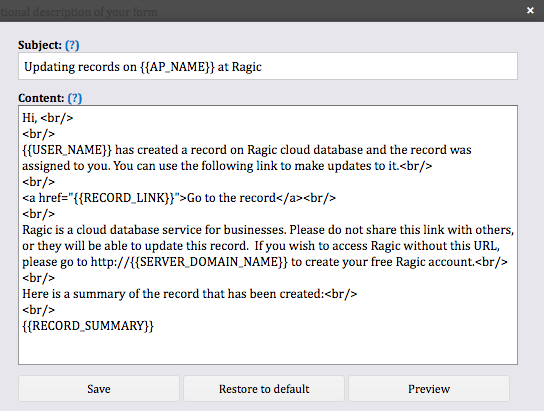 Ragic would now determine which records the guest user has permissions to view and edit. This type of temporary login is usually used so that the guest user can see and edit changes in the entries they have created. Anyone who has the authentication link will have the guest user login access. Therefore, it is important to remind the e-mail recipient not to share the link to others. If the recipient e-mail address has been listed as a user e-mail in the database (internal/ external user), the system will only provide a general entry url in the e-mail (not a guest user authentication link). This will prevent others from logging in with the user's account access, such as SYSadmin login access. You can customize the subject and the content of your e-mail notification by clicking on Custom Email link under the chosen E-mail field type. You can click on Preview button which will show you a demo on how the custom e-mail looks like. If you decide to use our standard template instead, click on Restore to default will discard all the changes you've made. Once the editing completed, remember to save before you exit the pop-up window. A verification e-mail is sent out when your record is created, with the e-mail address that is entered in the Guest User e-mail field. A verification e-mail will be sent out when the record is updated as well. To manually re-send the verification e-mail without updating the record, you can click on the blue "E-mail" icon next to the field name. 1. The guest user will always need to access the entry from the link sent with that e-mail. 2. Guest users cannot be managed in customized groups, they only belonged to "EVERYONE" group, therefore you cannot assign different privileges to them through Ragic's access right settings.